Virtualisation leviathan VMware has bought storage hypervisor maker Virsto. It means VMware can now aggregate servers, networks (thanks to its Nicira acquisition) and now storage into an abstracted pool of resources - providing the three pillars VMware needs to build software-defined data centres that can run themselves. 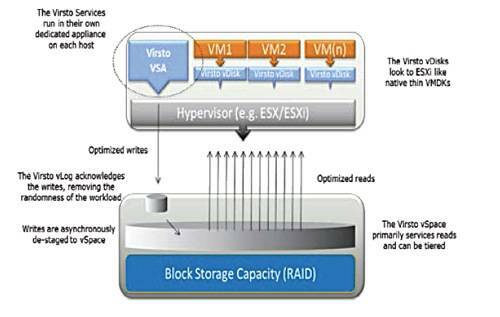 Virsto's software runs as a virtual storage appliance (VSA) in ESX and creates vDisks, Virsto's equivalent of a VMDK, to store data for virtual machines (VMs). The company makes all sorts of claims that it improves utilisation and provisioning speed. The virtual machines writing to vDisks are actually writing to a vLog entity that exists on shared external storage. The vLog acknowledges the writes and, in the background, sequentialises as much of the incoming random writes as it can by dumping them into a vSpace pool. It then writes the collected information to physical solid-state or hard drives, which can be organised into four tiers of storage. Reads take the other direction, from the physical storage, into the vSpace, and then to the individual VMs. Some like to refer to this arrangement of automatically directing data into a big virtualised vault as "software-defined storage". Virsto was founded in 2007 by CEO Mark Davis, CTO Alex Miroshnichenko and engineering veep Serge Pashenkov with the aim of developing a multi-platform VM-centric storage hypervisor. Their software supports VMware, Citrix and Microsoft's Hyper-V server virtualisation environments. August 2011: $5m added during a B-round. The new investors are Southern Cross Venture Partners and Correlation Ventures. Southern Cross was an investor in EvoStor, an Australia-based developer of storage solutions for the VMware market, which Virsto acquired earlier in 2011. June 2011: $12m in a B-round from InterWest Partners, August Capital and Canaan Partners. June 2009: A $7m A-round led by August Capital and includes Canaan Partners. Canaan Partners was also a seed investor in Virsto in 2008. 2008: Seed investment of, we estimate, about $2m to $5m. Virsto has grown quickly since it launched its product in February 2010. By November 2012 it boasted of record revenues and annual sales up ten times on the year before. Let's assume a five-times return for Virsto's VC backers, which gives us a purchase price of $100m or so. VMware didn't disclose the actual acquisition cost. Virsto's technology provides a much better virtualised server storage performance than VMware's own VSA which was introduced in mid-2011. There is obvious scope for combining Virsto's vDisk component with VMware's own VMDK entity and making VMs more resource-efficient. VMware's acquisition announcement points out that: "When implemented within a VDI, Virsto can reduce the cost of storage per desktop by as much as 70 percent." It states the acquisition "will expand VMware's storage portfolio". We envisage VMware's VSA technology merging with Virsto's in future. Take any popular storage array and you'll see ... a fully integrated storage stack wrapped in optimised hardware. Software-defined storage proposed an entirely different model for presenting essentially the same functionality: abstracted layers, running in virtual machines on a pool of shared servers. Physical dedicated storage arrays won't go away, then, but "the advent of software-defined storage products will ideally create a new category of price points for certain use cases" because commodity storage elements can be used. It will also enable a data centre admin to throw extra virtualised storage resources, such as server performance or disk capacity, at apps when they need it and return them to a pool when no longer required. It's interesting that Virsto functionality overlaps Microsoft's Storage Spaces and VMware must be aware that: in creating a complete server-networking-storage virtualisation stack it is going to be competing with Redmond.